How to restore and renovate a cast iron fireplace; how to strip any existing paint from it and then clean it and then how to re-paint or polish it. Renovating a period cast iron fireplace is a hugely satisfying project; understand how to go about it with this with our simple fireplace restoration guide. 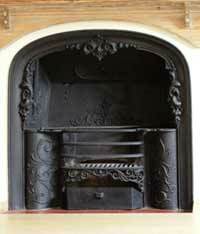 A cast iron fireplace is a lovely feature for a room, but they are costly things. If you are lucky enough to own a run-down old fireplace you can restore it yourself with a bit of hard work and patience. You could even buy an old fireplace from a reclaim yard and restore it, saving yourself a lot of money. Remove the Fireplace from it’s Current Location: If you can remove the cast iron fireplace from its place in the wall, this will make your job easier. If not, make sure you put down protective sheeting as the job can get messy. An old shower curtain makes a good protective cover for the floor, as it is waterproof. Remove any old Paint From the Fireplace: Firstly, you need to remove any old paint from the fireplace. Don’t try to burn it off with a blowtorch, as cast iron is a brittle material and can crack easily. Also, chances are the old paint contains lead and you don’t want to burn it, releasing toxic fumes. Use a Paint Stripper: Use a paint stripper such as Nitromors to remove the paint. Make sure you wear protective gloves, goggles and old clothes, and ensure the room is well ventilated as this type of paint stripper can be caustic and also gives off harmfull fumes. Brush the paint stripper on using a paintbrush, then scrape it away with a plastic or wooden scraper – don’t use a metal scraper as you could scratch or damage the fireplace. Use a Stiff Brush on Tricky Bits: For intricate bits of detail, a stiff nylon brush will be of help. You may find there are several layers of paint on your fireplace, so have patience and keep working at it to remove it all. Wipe Down With White Spirit: Clean off the fireplace with a cloth soaked in white spirit once you’ve got the paint off. Don’t let water get anywhere near the cast iron or it will start to rust quickly. Remove any Rust: If there is any rust on the fireplace, use wire wool to clean it off. A wire brush can be used for more stubborn patches. Painting or Polishing a Period Cast Iron Fireplace? Once your fireplace is restored back to its original state, you need to decide whether to paint or polish it. Whatever you choose to do, make sure you buy the right stuff to do it with. Grate polish can be applied with a rag, or if you prefer a burnished look, you can use WD40. If you are planning to paint the fireplace, give it a coat of red oxide first to prevent rusting. Buy a specialist paint, available from most DIY shops. If your fireplace is likely to be exposed to cold air at all, then a coat of Iron Paste or Black Lead can be applied, which will protect it. This can be buffed to a polished finish.